As part of their Christmas presents 'Im in the Garage' made my two sons these boards, the small one was posted to Singapore and the large one was given to my son who lives in England. Each have some interesting woods in them and it was fun seeing which particular wood looked well together before being glued and clamped. The wood is Oregon Myrtle kindly sent by Karen, quite a long time ago now, it is such a lovely wood that I just could not let all of it go to make shuttles. The glass embedded in it is antique and was purchased from Camden Market, London about 10 years ago. 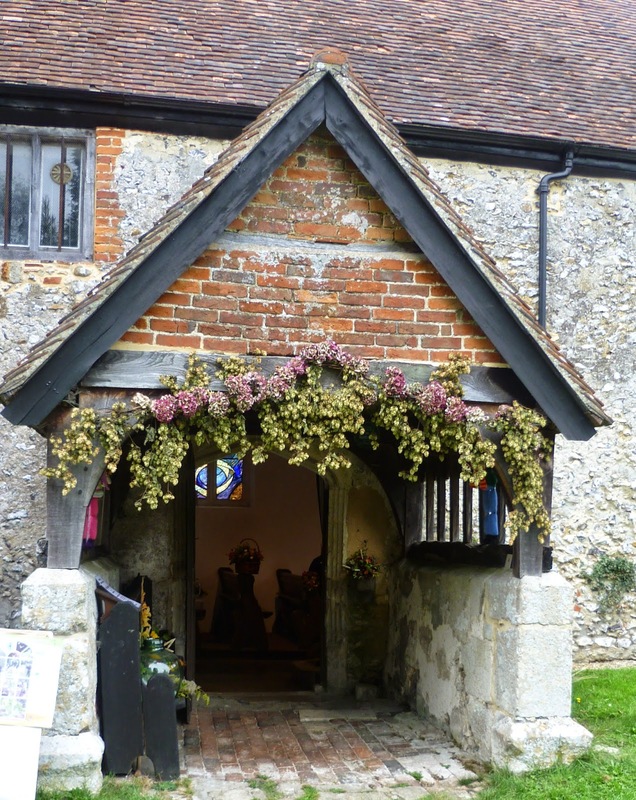 Today is Boxing Day, it was the day when the alms box, collection boxes for the poor often kept in churches, were traditionally opened so that the contents could be distributed to poor people. This box is in the wall of one of our churches but the key is lost so we are unable to open it! It was also traditional that servants were given the the day off to celebrate Christmas with their families on Boxing Day. Before World War II, it was common for working people (such as milkmen and butchers) to travel round their delivery places and collect their Christmas box or tip. I remember this tradition from my childhood when my parents would always have a tip for the postman, the dustman etc. 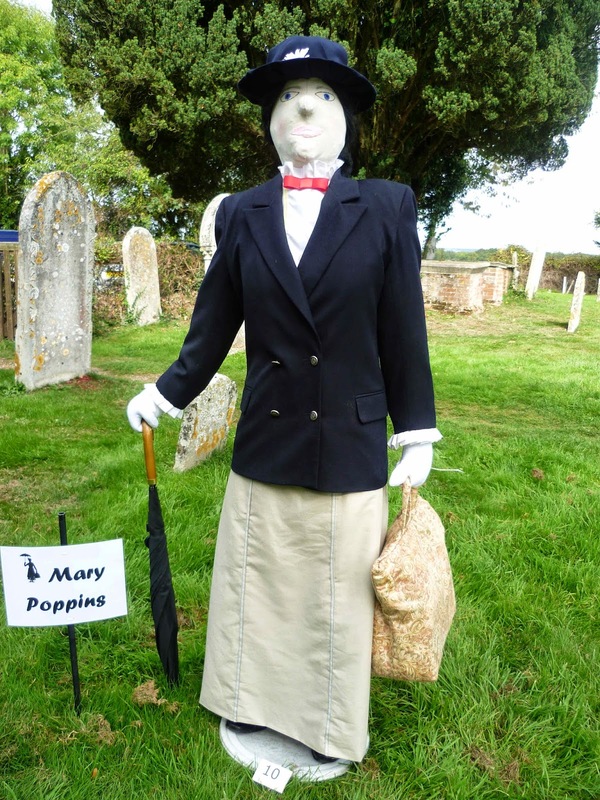 but it has now mostly stopped with perhaps some of the older generation carrying on the tradition in some way. Boxing Day is also a holiday but for some it means the start of the Sales so many shops are very busy and doing a good trade. 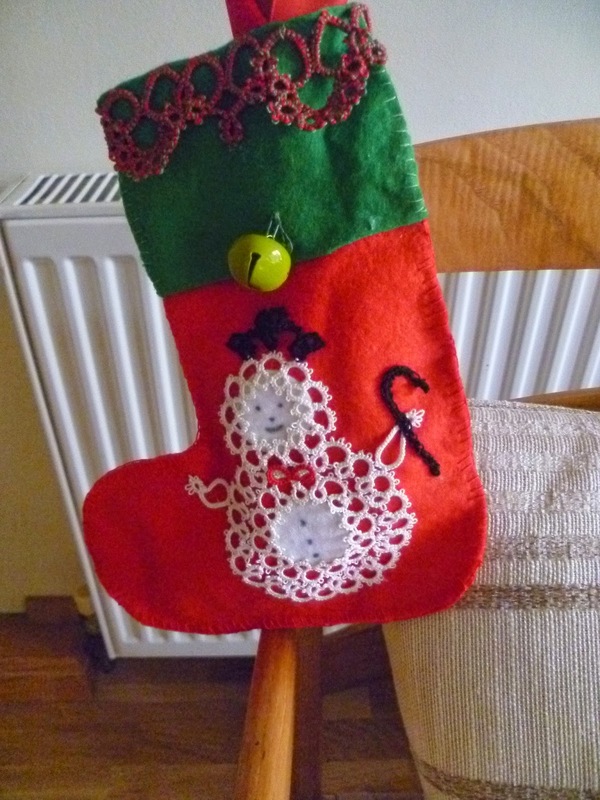 In case you think that I have just made these stockings, the answer is no. I put them together last Christmas, however the Snowman and Santa Claus I tatted over 20 years ago. They come from The Complete Book of Tatting by Rebecca Jones and in those days it was the only tatting book that I really used patterns from, there was no Internet and the book provided some different projects such as cats, butterflies as well as an abundance of Christmas tatting. How life has changed in the tatting world since then. 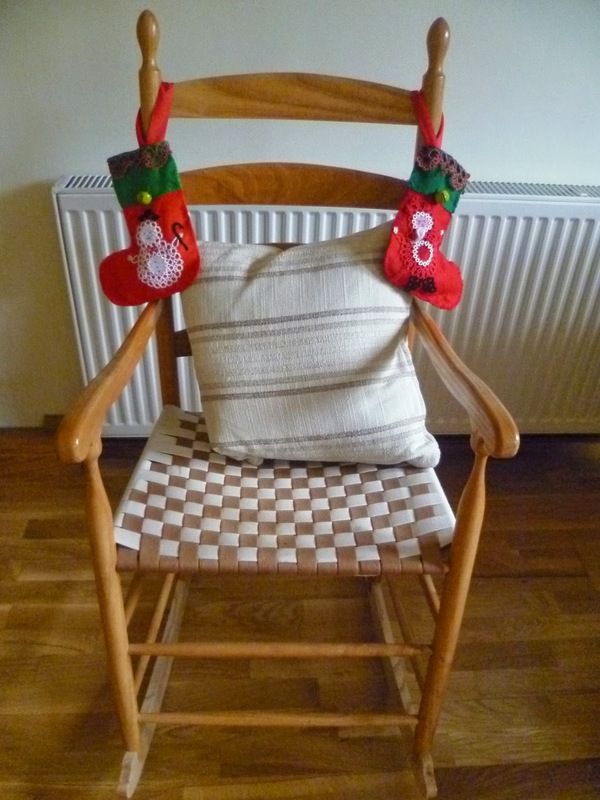 They are hanging on a Shaker Style Rocking Chair that 'im in the garage made and if you sit on it they give off a lovely jingle sound! Thank you for all the suggestions on what to do with the Christmas baubles, due to not feeling that well I only managed to put them in this cloth container, will make more of an effort for next year! Every time I think about tatting someone else's pattern to cover Christmas baubles I seem to come back to my own, probably because I know it will fit the ones I already have. I now have a box full of baubles covered in tatting, sadly that is where they will remain as there is no Christmas tree in this house to hang them on, next year is the time to have a grand clear out and give them all away. There is a final box of baubles but I don't seem to have a picture of them at hand. The patterns for the large and very small baubles are on this blog. I do hope your Christmas Tatting is going well. Since October I have been steadily making holly wreaths, mainly to give away at Christmas. 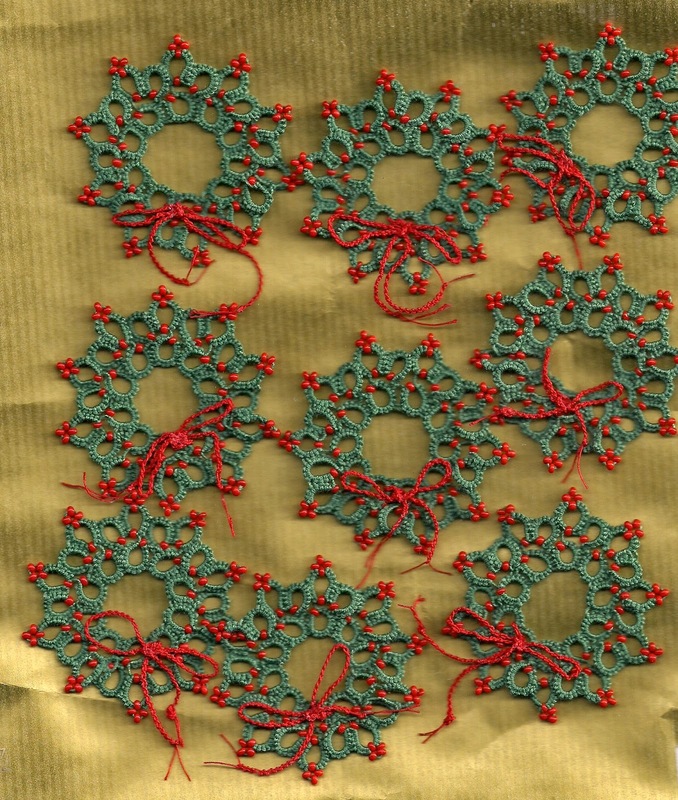 The pattern that I am using is Sharren Morgan's Merry Wreath pictured on her blog. She brought the pattern to the Tat Days in 2012. I had the great pleasure of meeting her there and being in her class. The main difference between my my holly wreaths and hers is that I put beads around the outside as well as the inside, obviously to represent holly berries and I also tatted a bow. I have now made well over 20 of these and used up hundreds of tiny red beads, but fortunately I have a huge packet of them which one of my sons brought make from Asia a couple of years ago, they make excellent berries. In this picture is a real piece of holly and it is covered with holly wreaths, including earrings. 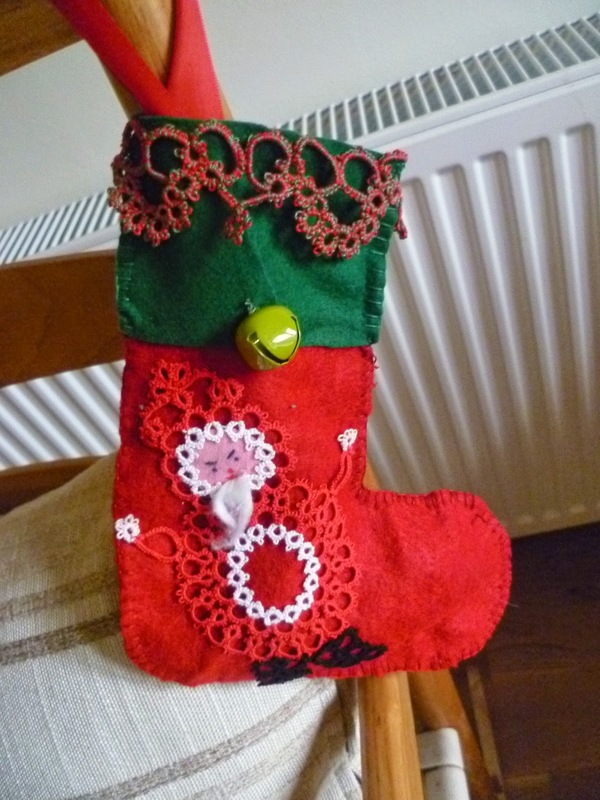 At the front is Mary Konior's Posy pattern which also has lots of beads added to it. Well back to making more as I don't want to find out at the last minute that I have run out! Before I announce the winner I would like to thank everyone for entering and writing such lovely comments. Just to explain that I started the count from Stitcherty Grub because Anne above then sent me another comment! 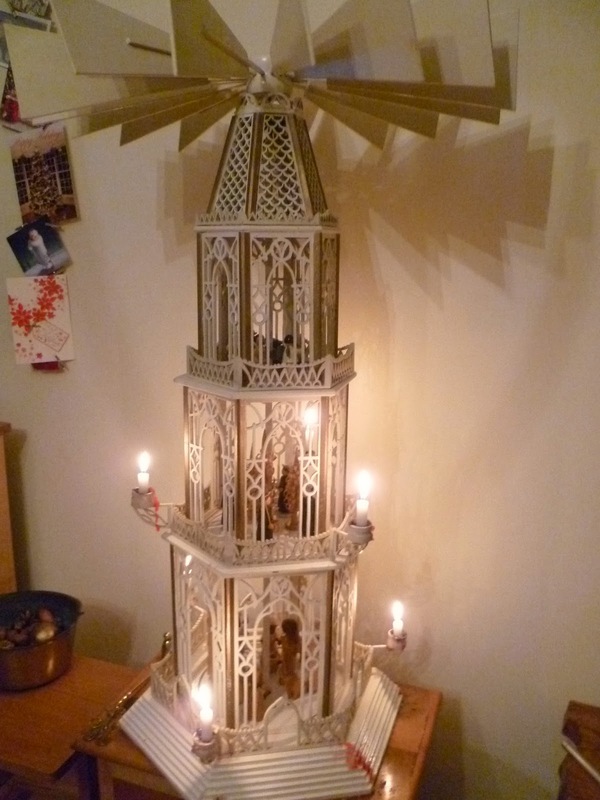 Anne I will take a photo of the stand when the Advent wreath comes off after Christmas. For those of you who seem to miss the pop-a-bobbin shuttles when they go on sale, there is a chance to bid for two that I have now put on e.bay, they are the old type of shuttles, perfectly usable but the hooks were homemade. Just look on e.bay UK under Tatting Shuttles. 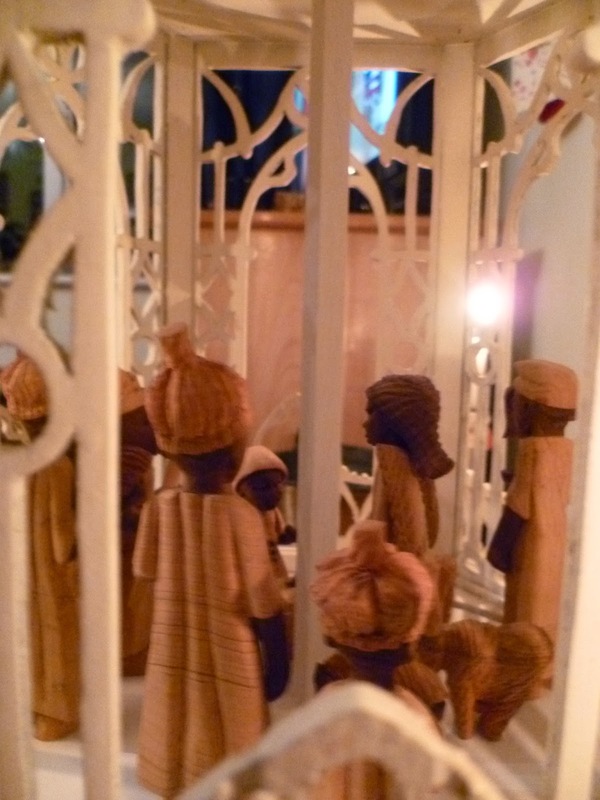 Today is quite special for many reasons it is Advent Sunday in the Church. Advent is a term from the Latin word 'adventus' which means "arrival". It is a time of waiting for the arrival of Christmas and is associated mainly with Advent Calendars and in particular the fun of opening to see what is revealed behind each number! Whilst in Scotland the people are celebrating St. Andrew's day as he is the Patron Saint of Scotland. Google has marked the day with a doodle of the Flying Scotsman - the world famous steam locomotive. However, here on this blog there is a special giveaway. Please leave a comment if you would like the chance of winning the shuttle and thread holder (please note this does not include the piece of wood underneath or the foliage), you have until 3rd December when I will announce the winner by using a random number generator. The shuttle is made out of sequoia, the tree that the wood comes from stands in front of the church in the village where the Revd Awdry author of Thomas the Tank Engine stories spent his early years, as his father was Vicar of the parish. The shuttle is varnished and the thread holder is made out of mahogany but has only just been cut out so needs some finishing touches! The Giveaway is open to everyone across the world but please respect the fact that it is only people who tat that should enter. That is of course, if you win, then the plan to pass the items on to someone else who can tat. I will also put a few more items in the package before I post to make it more festive. I do hope those of you in the USA had a wonderful Thanksgiving. Here in the UK we were treated (not sure if that is the right word) for the first time in a really big way to Black Friday. Retailers slashed prices and in some stores there was very little English politeness as fights and scuffles broke out with people trying to get bargains. It was a day on which to avoid the large supermarkets. 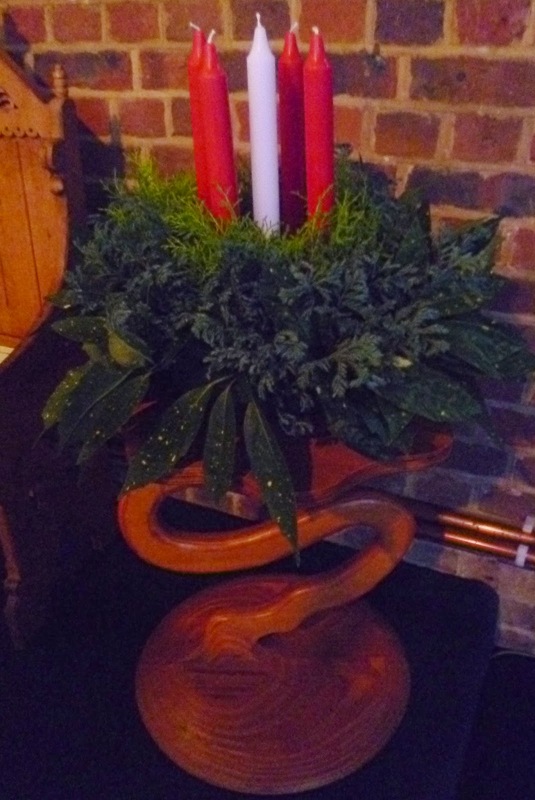 On a calmer note here is the Advent wreath in church ready to be lit this morning. Which is the title of Marilee"s latest book which Sue Anna kindly gifted me whilst Jane brought it back from Tat Days to eventually pass on. I straight away, after only just getting the book into my hands, made the Flower Chain. However, I added beads to the outside chains, just because I like beads really, for no other reason. As I did not have any size 10 thread I used 20 but otherwise stuck to the pattern, promise! I am very pleased with the result and hope to wear it very soon - yes it is for me. Fortunately if anyone requests another necklace, I do have enough of the larger beads to make at least one more. They come from a rather lovely necklace that was in a charity shop, although not my style the beads are of a good quality . Look out for my next blog post which will include a give-away. I have been very tempted to join one of the exchanges that have been taking place on the various Facebook groups. But by offering a give-away it does mean that everyone has a chance to win especially those who do not feel they can afford to take part in an exchange. Also you may have noticed that 'giveaways' are not so common as they used to be, so to cheer up the dark dreary Winter days why not have a bit of fun! 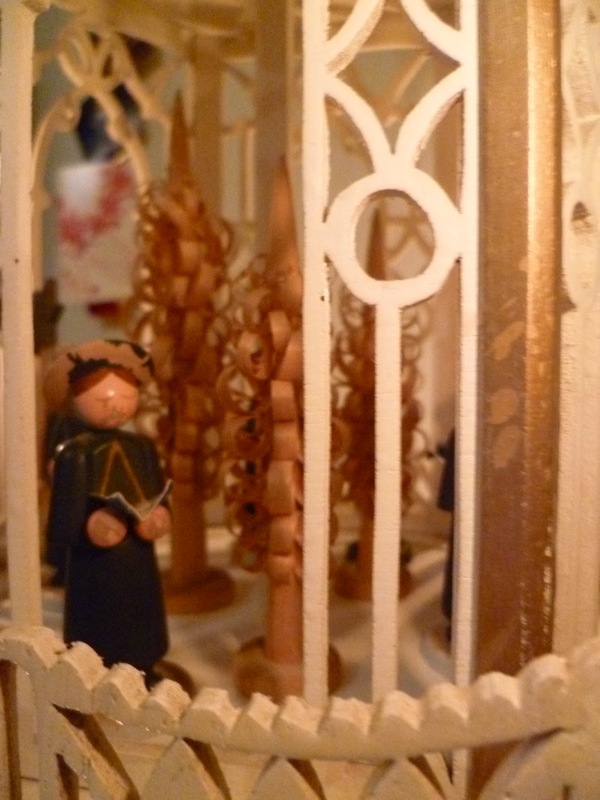 Well all the shuttles have been sold and there are only the tree thread holders left in Jane's shop. The shuttles are now jumping on aeroplanes and travelling all over the world, such a lovely thought and I hope they enjoy their new homes. Watch out for a give-away which I hope to do soon, a sort of thank you to all who follow this blog and those who have bought shuttles. At the moment the house and garage are in a complete mess as shuttles, tatting and other craft work seem to have invaded every available space. Another batch of pop-a-bobbin shuttles and post shuttles will be on their way to Jane this weekend. Included in the batch are some flat shuttles and a new thread winder just in time for the festive season. Although the thread winder is a new item and we are not sure if anyone would really want it! 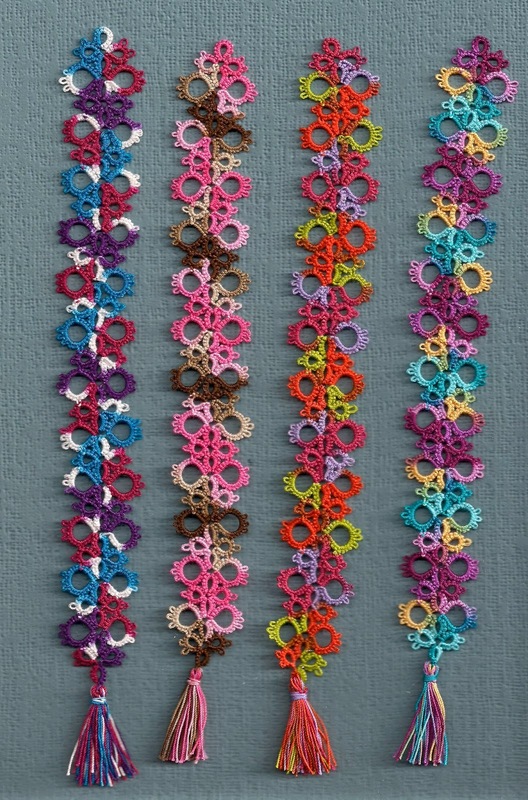 On Saturday there is a Christmas Fayre at one of the churches so I am taking some tatting. I am really not expecting to sell much as these events do not generate much income, but it is a chance to 'show case' my talent (with the usual helpful and unhelpful comments) and get all the items hidden in boxes out to see the light of day! I have also crocheted these corsages or brooches, which ever you wish to call them, for another stall, well it was much more fun to do than make cakes. I do love cooking but find that my cakes never look as good as other peoples! The most annoying part about these Fayres is that you always have bright ideas of what you think might sell at the last minute. Then you proceed to spend precious hours making them only to find that nobody is interested in buying such items! After this weekend I hope to get the house back to some normality. I have finally come to the end of the cup cake addiction and now on another one, which I will show you soon. 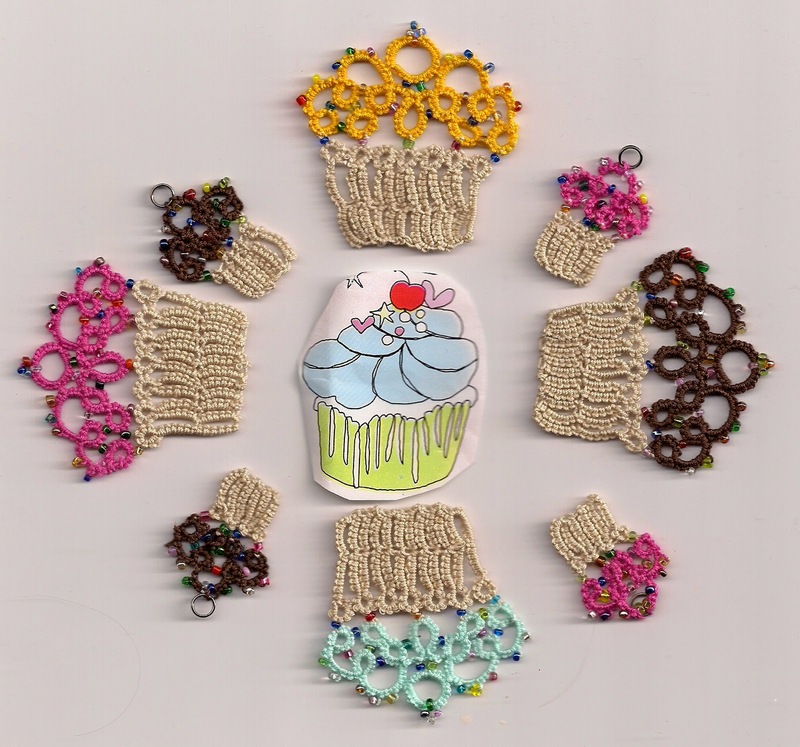 Here are some to wet your appetite - strawberry, lemon, chocolate and mint cakes with two pairs of earrings. What was particularly good about this pattern was that it used up some of my bead soup, so much fun using random coloured beads together. A batch of pop-a-bobbin shuttles and post shuttles are just coming to the end of their production and now it is final testing, a stressful time! Sadly there are always rejects, and here are some of them from past batches, we do not have the heart to throw them away so they stay in a special box. Some evenings when I am actually at home and not out attending meetings etc, Jane and I scan in what we have tatted and e.mail it asking each others opinions. Although I have to say that this is rather one sided as I find very little time to tat, especially anything new. It can be very hard making any criticisms when it comes to other people's tatting especially when it happens to be your own sister! Not every time is my opinion asked but I do get to see most her patterns, if not all, before they are published. Occasionally I find time to tat them too, not as a test tatter though as I tend to know where her patterns are going anyway and if I don't then it is usually because I am too thick to understand and have to shout for help! The inside out snowflake I tried before Jane published it on her blog and this is the first and only one I have made. I decided to use some really long bugle beads that I had been given ages ago. 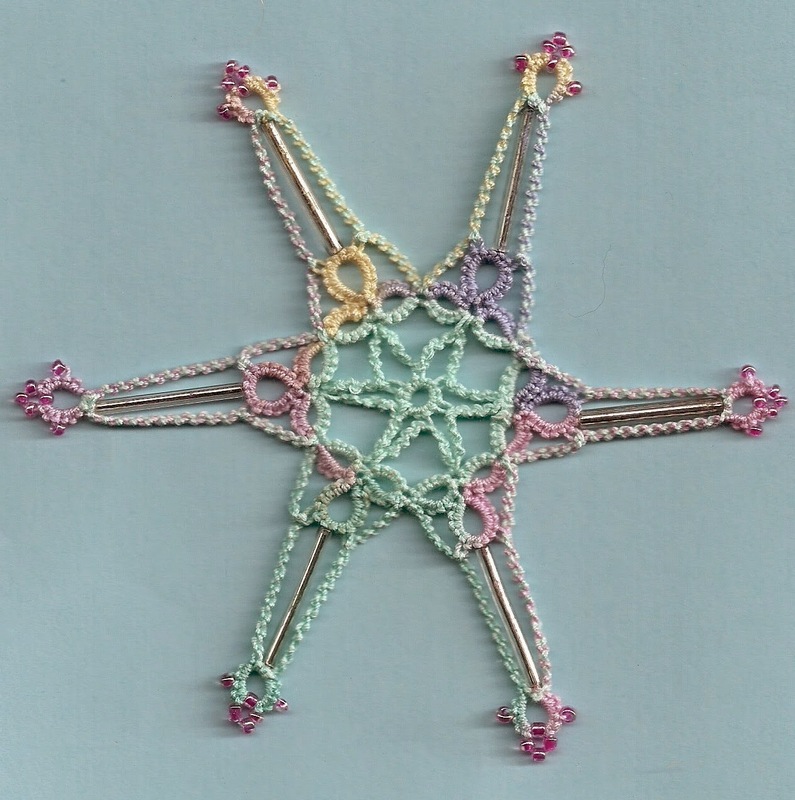 Now for the star, quite unusual to find a five pointed tatted star pattern, this one is from Rosemarie Peel's tatting for pleasure it is resting on some post shuttles which need to go on a journey! So I can't wait to show you the next pattern that Jane has designed, I hope she blogs about it soon! Someone has asked me for small snowflakes to put on an angel that she is making. 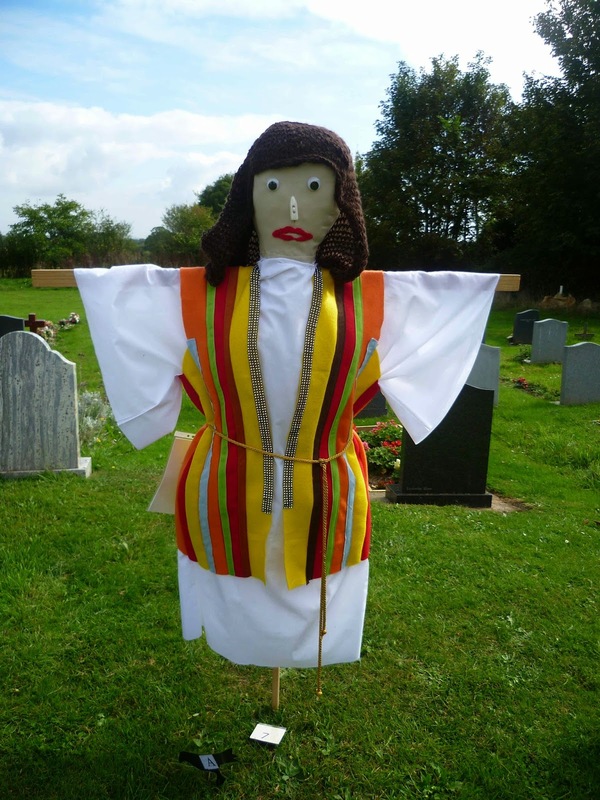 The church she attends is asking the congregation make angels so that they can be displayed in church at Christmas. However trying to find a pattern that was interesting but effective was a bit of a challenge. I started with the large one which is Renuleks , but that one was far too big so then made Betsy's snowflake which you can find here. My final attempt to find one even smaller is from Jeanne Lugert and this snowflake is so delicate and just right. 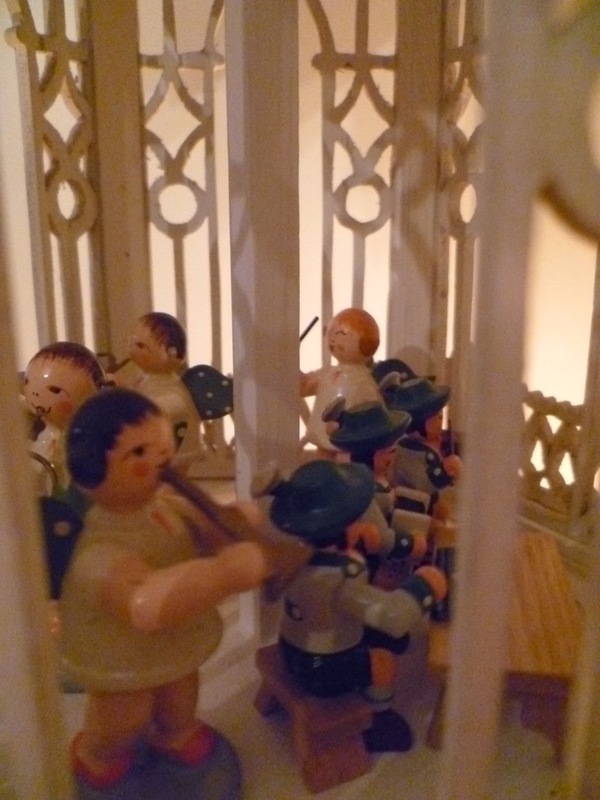 I did alter the picots slightly to make them more flaky looking and was pleased with the effect. All three snowflakes are tatted in one round so only two ends need to be tied. 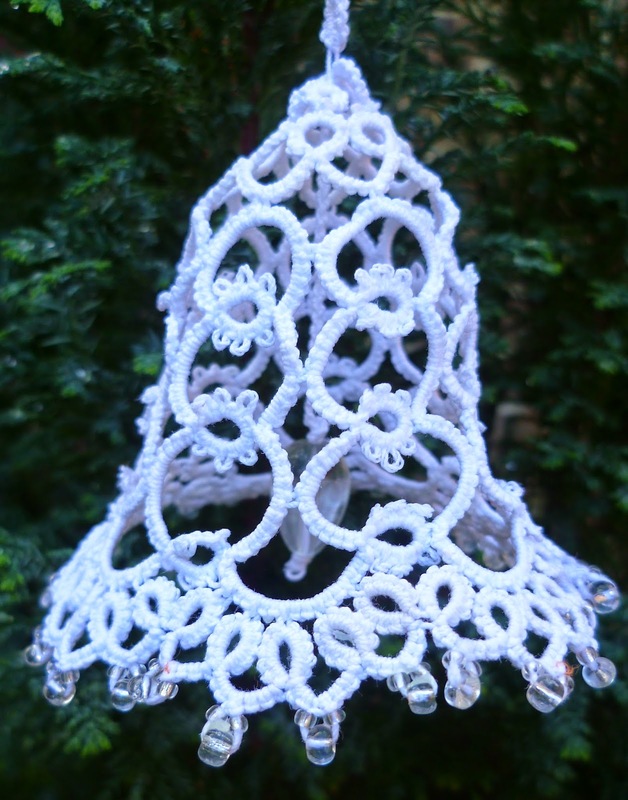 I hope to see the angel that I have made three of the smallest snowflakes for, especially as there is now talk of tatting a 'halo' - which could be a bit of a challenge! I will also need to see the angel to get measurements for such a holy head piece if it is required to be tatted. The title of this blog post sounds like afternoon tea, doesn't it? Sue Hanson has given us some very interesting wood, but some pieces are too small to make shuttles from, however sanded and polished they stand out on their own. The wood that the cup cake is on is called Raspberry Jam! Apparently it refers to the strong odour of this freshly cut wood, which resembles raspberry jam. The tree is found in Western Australia, those who live there can perhaps throw more light on what I have just written? The cup cake pattern is one that Jane taught at the Palmetto tat Days and I am giving this particular example away tomorrow to the person who cooked some amazing cup cakes for the Scarecrow Festival. As for the pattern (unless you are Jane's sister) but she only has one so you can't be! Or you attended Tat Days and then of course there is a good chance you will have this pattern, then you will have to buy the CD with all the patterns on from here. I am in the process of making a chocolate one and intend to tat some earrings too. This is a bigger piece of the Raspberry Wood and hopefully some shuttles can be made from it. Someone in the USA has requested six of my thistle bookmarks. It is strange but whenever going back to a pattern there seems to be something you want to do to improve on it, especially a few years down the line. One of the more noticeable things I did was to tat a different tail. Here you can see one with split rings and the other with the technique Jane has just put on her blog a half double double stitch. They both look fine but I think I prefer the slimmer stem! 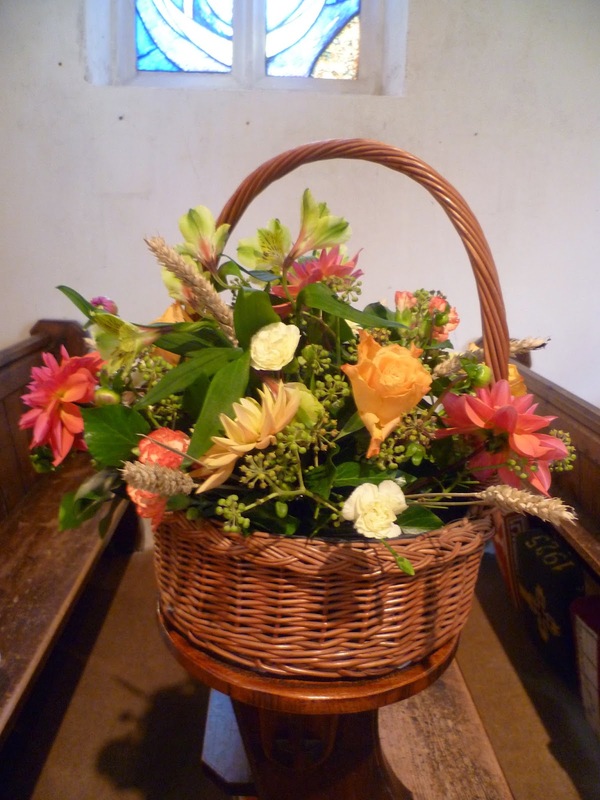 We have just celebrated harvest in our parishes and there were some lovely decorations, although I forgot to take pictures of the fruits, but at least have some flowers! Hops are used primarily as a flavouring and stability agent in beer, to which they impart a bitter, tangy flavour, although they look so pretty hanging over a porch. If you look through the door you can just see the basket sitting there! I have just finished all the motifs for the mirror magnets over 30 in total and all but two are stuck on. It was very difficult photographing them but managed a few reasonable pictures in the end. By tatting them I used up a lot of odd beads that have been lying around and also managed to reduce my 'bead soup' a little, although need to try harder with that problem! I seem to have a lot of bead spillages and now have two containers full! But they look so beautiful when all together. This afternoon I read about the Aka tribe from a copy of the National Geographical Magazine, they live in the northeast corner of India. Apparently they have more than 26 words to describe beads. Beyond being objects of adornment, beads are status symbols and currency. Do you know what I could go with that idea! First I must apologise to Jane McLellan for failing to acknowledge that the bookmarks in my last post was one of her patterns which you can find here. The other Jane (my sister) passed the pattern on to me before either Jane M or myself ever had a blog and it remained on a piece of paper without a title or anything. 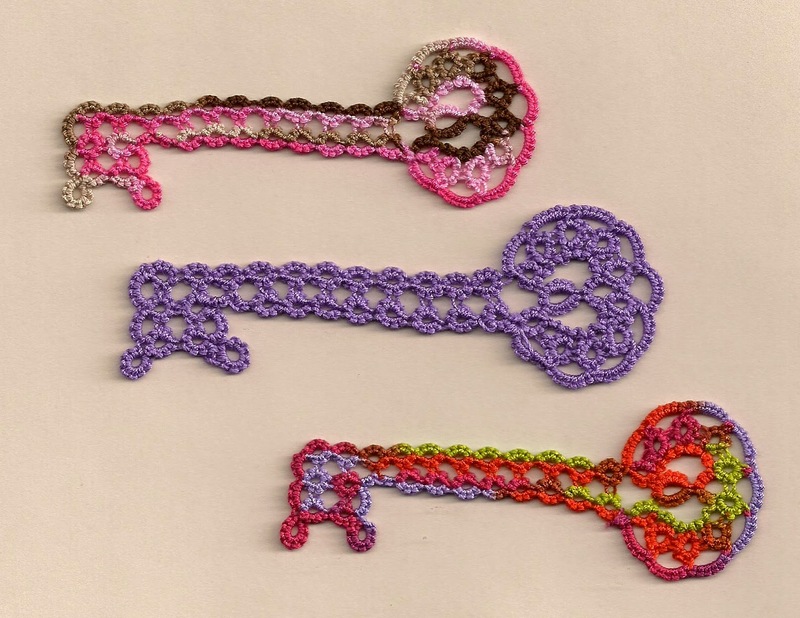 I have just finished this bookmark from Robin Perfetti and it can be found here, Robin has some lovely patterns and it is worth a visit to her blog. I was going to make a border but could not find anything to sew it on to and so made a bookmark instead. 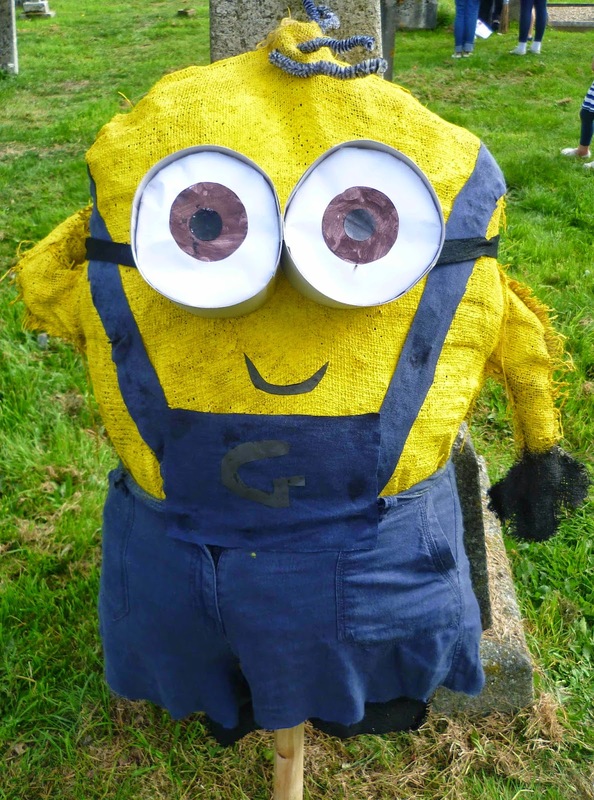 I have been very busy over the last few weeks organising a Scarecrow Festival and here are some of the ones that were on display, they were very cleverly made. The children so enjoyed seeing them recognising the characters. I am really getting tired of some of the thread in my stash and thankfully most of the balls have nearly reached the end. Isn't it strange when you want them to run out they don't but when you are doing a really important project there is never enough thread? 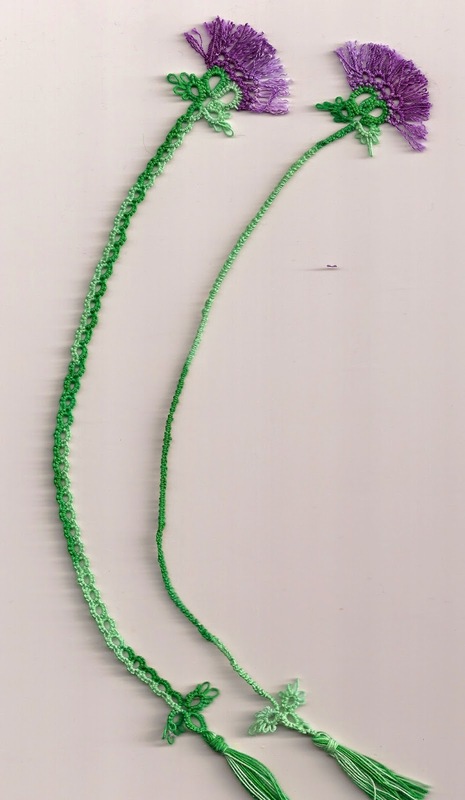 So to try and use the balls fairly quickly I have begun tatting these bookmarks, very relaxing to make too. Now Jane is really hooked on these solar powered "flip flops" (forgotten what she calls them), the scarecrow one was given to me when I was in the USA with her and I treasure it especially as this weekend I am organising a scarecrow festival. The other one I bought in Singapore but sadly I knocked it off the windowsill this week and the flower broke of so it was replaced with a tatted one. More wood has arrived in our house (via my son who was storing it for us in London) and the selection is amazing, hopefully soon I will be able to post some more pictures of the shuttles that are being made. Before Jane left for Palmetto Tat Days I spent a few days with her and one evening we tatted together this clever pattern, it was actually the lilac key in the middle. After returning home I tatted some more, they only take less than an hour. That same evening Jane designed one with a crown on top, but you will have to wait for that beauty. The pattern is actually on the Tat Day's CD but of course being Jane's sister I was fortunate enough to try it before then. 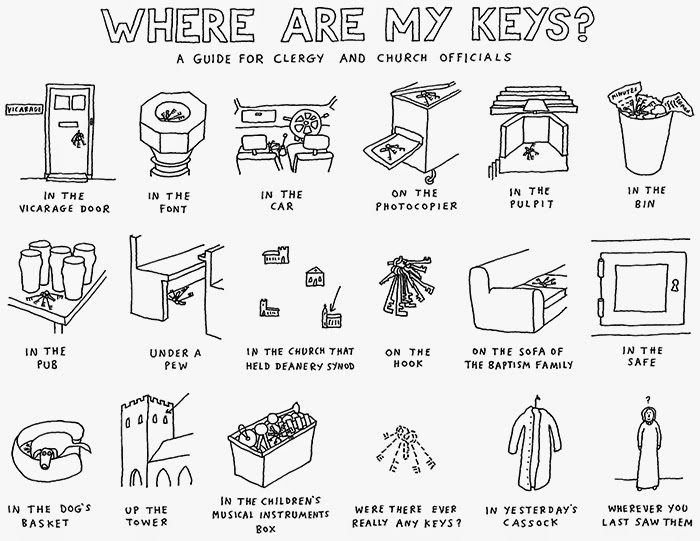 There are four churches in our benefice so you can imagine the amount of keys that some of us have to travel around with. This is the largest of the keys and because of its size there is another system to get into the church and this one is not used that often. There is always a danger in loosing keys and this frequently happens to the Vicar and myself! The cartoon shows possible places we have left them and I can relate to more than one. The main problem is that there is usually at least two keys that are needed for each church so the bunches of keys we all have are extremely large. Of course you might think too large to loose, but that is not true, especially as they don't fit in a pocket so you usually put them down somewhere! Sometimes it feels that my life is ruled by keys, now I can tat them it is a little more soothing! Following on from the wood that Sue Hanson gave us whilst in London, some shuttles are in the process of being made. I say 'process' as these pictures do not show them fully completed, they still need some more sanding and oiling. But thought you would like a quick look at them. A request from Sue was to have an indent for the finger/thumb on the top of the shuttle and here it is on a holly one. I am still tatting the inserts for the mirror magnets, here is a selection. They are going to be Christmas giveaways unless they find new homes before then! As you can see in the last post the packets of magnet mirror frames contained square as well as round ones. They did not look so good with the buttons in the middle so I used these thin silver bits instead. I have had them for over 30 years as I bought them when we lived in Hong Kong, so it is great to put them to good use! A picture of the wood we managed to get back on the train from London a few weeks ago in a shopping bag, rather a nuisance when travelling on the underground! There is a good selection of wood even in this little pile and now we are waiting for our son to visit, then hopefully he will be able to bring some more of it back, at which point there will be even greater excitement in the garage! My son has a very small two seater car so it is going to be sometime before it all is safely stored in the garage. In the meantime we have been trying to make room for the new selection of wood. The dark pieces you see are not all ebony, there is some violet rosewood and when cut it is a lovely dark red colour. For those with good eyes you will also see a piece of Australian Gum. At the moment post shuttles are being made for Sue Hanson out of some of the wood, but more pop-a-bobbin shuttles will be made soon.